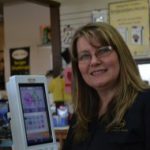 Annette Walter has over 20 years of outstanding retail management experience. She has an extensive knowledge of all the brands we carry and even teaches many of our machine guide classes.She leads by example and strives to maintain a positive atmosphere where customer satisfaction comes first. She enjoys embroidery, sewing, and quilting in her spare time.